where Kr is the system gain and t is the lead-time constant (see Section 18.1). For a high-gain system, the equality in Eq. (18-105) is chosen; this provides the best transient yaw response [Dougherty, et al., 1968]. Equation (18-109) may be used to estimate the system gain, Kr, and angular momentum, h.
A spacecraft undergoes periodic motion if it is disturbed from a stable equilibrium position. For a spin-stabilized spacecraft, this periodic motion is rotational and is known as nutation (Section 15.1), whereas for a gravity-gradient stabilized spacecraft, it is oscillatory and is known as Hbration. Nutation and libration occur as a result of control or environmental torques, separation from the launch vehicle, or the motion of spacecraft subsystems such as the tilting of experiment platforms or the extension of booms and arrays. Normally, an attempt is made to suppress or damp this motion because it affects the performance of sensors, pointed instruments, and antennas. However, Weiss, et al.,  have shown how nutation can be advantageously used to scan the Earth. In such cases, a desired scan motion can be reversed without the use of energy by exciting controlled nutation modes. Nutation or libration can be damped by passive or active devices. A passive damper is one which does not require attitude sensing, is driven by the motion itself, and dissipates energy. The frequency of the damper is intentionally kept near or equal to the rigid body frequency so that it significantly affects the motion of the spacecraft. An active nutation damper may be used if the initial amplitude of the motion is large, if the damping time of a passive damper is prohibitively long, or if passive damping leads to an undesirable final state (Section 15.2). In such cases, the attitude control system provides the necessary damping torques. As discussed in Sections 15.2 and 16.2, a rigid spacecraft can be stabilized by spinning it about the axis of maximum or minimum moment of inertia, called the major and minor axes, respectively. Nutation occurs if a spacecraft does not spin about a principal axis. Thus, the problem of nutation damping is that of aligning the nominal spin axis with the angular momentum vector by dissipating the excess kinetic energy associated with nutational motion. For a rigid body, this is possible only if the spin axis is the major axis, i.e., the principal axis having the largest moment of inertia. Table 18-3 summarizes the characteristics of several types of passive dampers. Real spacecraft always have some damping and associated energy dissipation. This may be either inherent in the system (structural damping), due to spacecraft components (fuel slosh, heat pipes), or due to the nutation damper hardware. Lord Kelvin [Chatayev, 1961] showed that a body which has been stabilized by gyroscopic means can lose its stability in the presence of dissipative forces. 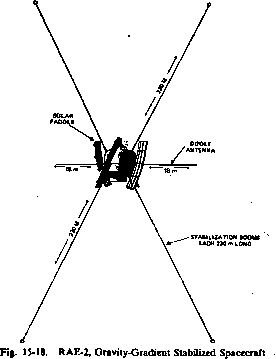 In 1958, Bracewell and Garriott  showed that a slightly flexible spacecraft with no rotors or motors can be spin stabilized only about its major axis. During the course of publication, this result was confirmed when Explorer 1, launched in February 1958, started tumbling in the first orbit because it was spinning about its minor axis. A dual-spin spacecraft with two axisymmetric rotating components can be stabilized about a minor axis in the presence of damping on one of the components [Landon and Stewart, 1964]. In this case, damping in the slower rotating component has a stabilizing effect and overcomes the destabilizing effect of damping in the faster rotating component.